Adult ibexes are not to be taken lightly. 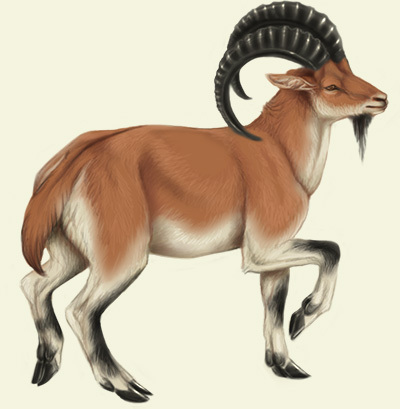 With large, curled horns, ibexes are not slow to attack and can cause heavy damage on any enemy. On any journey in the mountains, ibexes are good companions to take along; they maneuver well on rocks, and enjoy eating the tough grass that grows there. When not traveling, ibexes enjoy mock fighting with each other and hunting for grassy treats. Traversing a mountain, you glimpse a fleeting shape. Advancing slowly, so as not to startle it, you see a creature much like a mountain goat. The only differences are the size; it is clearly more muscled than any goat, and boasts beautiful curving horns that could be deadly. It watches you approach with suspicious eyes, then decides you are no threat and continues munching on the sweet grass it has found.